I needed to grab a few more essentials for school, so my little guy and I headed to the local outdoor sporting equipment company. After perusing the shop, we decided on a couple pairs of trackie pants, new sunglasses, a few drinking cups for his lunch box (which are basically glorified sippy cups without looking like sippy cups, if that makes any sense. I mention this now because it will be useful information later in the post) and a chocolate bar - for good measure, of course. When it was my turn at the till, this cool hipster guy was everything but cool after the first two minutes. He had something to say about almost everything we bought. "Oh, Ritter Chocolate has this amazing bar with crispy rice cereal in it", he says. "Seriously", he continues, "The crispy rice is much better. I can go over and grab it for you." "Uh, no thank you. This is his choice. We're good." "NO, THANK YOU. WE'RE GOOD". Picks up the sunglasses next. "Did you see they have Spiderman glasses? ", he says. "They have those glasses in blue as well." "Yes, as I mentioned, we saw them. He likes turquoise and he wanted these." "I thought maybe he would like the fit better." At this point, I'm getting incredibly annoyed. The cashier next to him coughed really loudly as if to say, 'Dude, SHUT YOUR DAMN PIE HOLE". If he hadn't done that, I would have thought I was secretly being filmed for a gag reality show. The trackie pants went through the checkout process without so much as a peep. Thinking this dink finally got the hint, we got to the drinking cups. Picks up the first one and asks, "How old is he?" I scrunched up my face, confused, but answered, thinking he's now trying to redeem himself for his earlier outbursts. "He's three", I answered. "Do you know he shouldn't drink out these sort of cups after two years of age, but since he's going to be, make sure you take the valve out of the bottom of the lid. Dentists have warned the dangers of causing an overbite." And just like that, ladies and gentleman, he's back. I stood there with my mouth gaped wide opened, gobsmacked. I shook my head. "Let me ask you something. Do you have kids?" I asked him. "Well, as much as I love unsolicited advice from folk like yourself, I know I would appreciate if you kept it to yourself right now. I'm not trying to be rude, but it's best not to say anything if you don't fully understand." His response? "Both my sister and brother have kids. I think I get it." To the future wife or girlfriend of this clown, I have two words. Preheat oven to 350°F. Prepare a 9-inch loaf pan by spraying with a non-stick coating spray; set aside. In a mixing bowl, using an electric mixer, beat cream cheese, sugar, and egg together until smooth and creamy. Set aside. In a separate mixing bowl, using an electric mixer, beat together bananas, pumpkin, eggs, vanilla, oil, brown sugar, and molasses. Sift in flour, cinnamon, baking powder, and salt. Beat until combined. Pour half pumpkin mixture into prepared pan. Pour cream cheese mixture over top and top with remaining pumpkin mixture. Sprinkle with pumpkin seeds if so desired or using. Bake for 50 minutes to one hour or until skewer inserted comes out clean. Remove from oven and allow bread to cool on a wire rack for about 10 minutes before turning out on rack to cool completely. Ha! 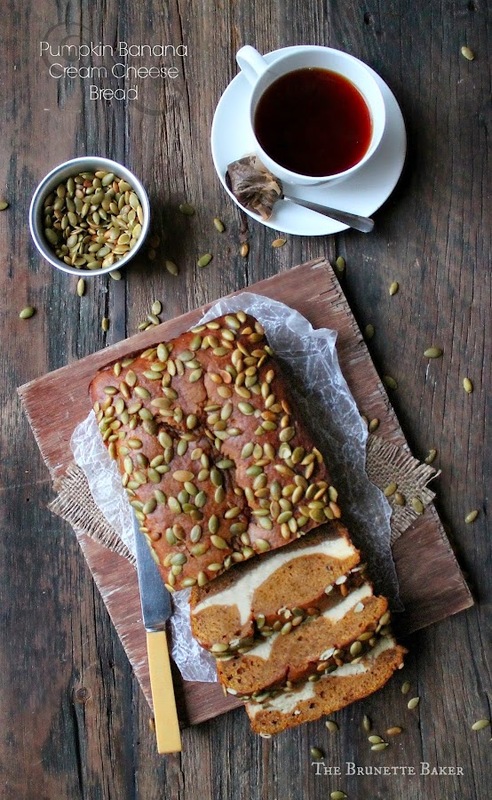 Awesome read and that pumpkin bread looks OFF THE HOOK. This looks really beautiful! I have an out of control pumpkin obsession. Which I feel like is common these days! I laughed out loud at "thinking this dink finally got the hint!" LOL! He sounded like quite the joy :S! As annoying as this dude was to you, this was a very entertaining read! Some people just have no social skills. The nerve! This bread looks delicious. I love that cream cheese swirl! As if it's not hard enough to shop with your own kid! Wow! Your bread looks beautiful and so delicious! Thanks for the great recipe! Pinned! Totally obsessed with that cream cheese swirl going through the bread! 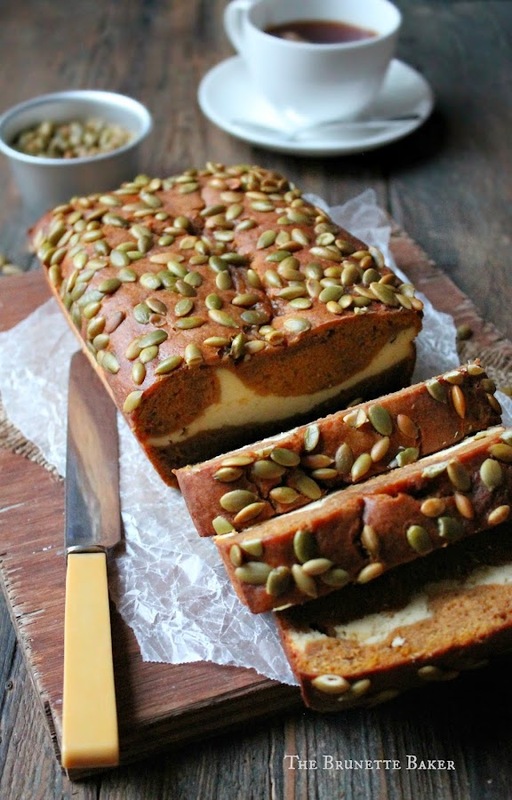 Wishing I had a slice to devour right now, this pumpkin bread looks so tasty, moist and of course delicious! Wish I had this right now! Thanks for linking up with What's Cookin' Wednesday!